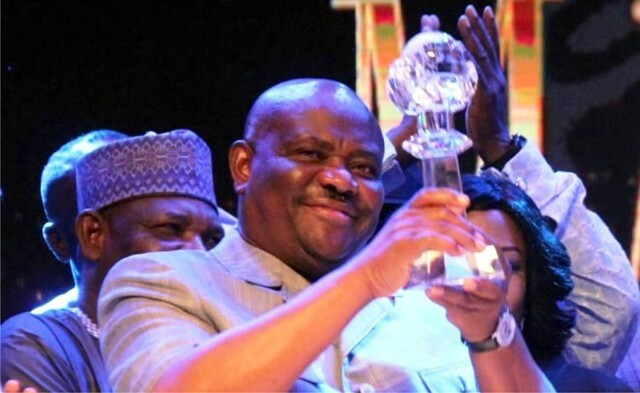 Rivers State Governor, Chief Nyesom Wike, displaying the Silverbird Man of the Year 2017 Award, during the presentation of the award at the Eko Hotel and Suites,Victoria Island,Lagos, last Friday. 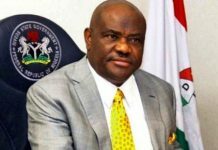 The Federal Government has threatened to withdraw funding for the suspended N120billion Bonny-Bodo Road project as a result of lack of cooperation by host communities meant to benefit from the project in Rivers State. 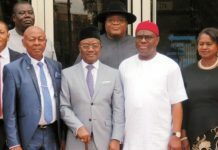 It called on leaders of the affected communities to unite, adding that the N60billion fund released for the project by the Nigeria Liquefied Natural Gas (NLNG) might be refunded, if the host communities failed to agree on specified terms. 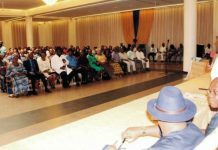 The Minister of Power, Works and Housing, Babatunde Fashola, gave the warning to leaders of the communities at a meeting in Abuja, which had prominent traditional rulers from the Niger Delta region, officials of Julius Berger Plc, NLNG and council of elders from Ataba and Gokana, among others, in attendance. Fashola begged the leaders of the communities to forget their differences, and stated that if the discord persisted, he might petition President Muhammadu Buhari over the issue and ask him to withdraw the N60billion contract sum already released for the project. 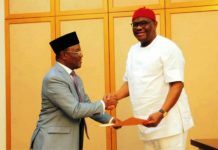 He explained that the Bonny-Bodo road project had enjoyed the largest funding, as the NLNG was providing N60billion with additional N60billion counterpart funding from the Federal Government. The minister told his guests that the contractor handling the project had been mobilised, yet the project was suspended due to lack of cooperation from the benefitting communities. Fashola expressed worry over the position of the elders, who insisted that the project would not be implemented except they were carried along, and an additional route constructed in Ataba. He said, “You must work this peace. Today is Thursday, since you said you know the permanent secretary, I will leave you with him. All I want is a peace accord and an invitation to Julius Berger not later than Wednesday, February 28. Otherwise, I will write a report to Mr. President that it doesn’t seem that this project is ready to go, but we can move the money to another project. Fashola added, “For us, we can’t keep the money down. The contractor has received his money but now he can’t work. There are projects where contractors are waiting for money, but they don’t have it. That is a contradiction that will not last long. “So, I will leave you. You know where we stand. We have an idea of where you stand. For me, it is a compromise that holds the project. The NLNG will not be there forever. It took time to even beg them to release this money. So, if you don’t take ownership of the project and put it to use, we might as well tell them to take their money back, and that the project is not ready,” the minister added. “We need to have a position within two weeks for MoU of compromise to be signed assuring us that there will be peace in that place. 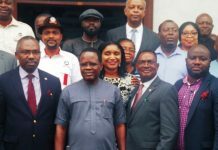 “You must invite the contractor back to site and ensure that you suggest to them anything you want the contractor to do because you can’t take over their business,” he said. “I must emphasise at this time very clearly that it is in your hands as people who will be affected to either own this project or turn your back on it. “I am sad to hear that the contractor is being attacked, his property in Gitto yard being vandalised, topographic survey and other works being stopped in your communities. 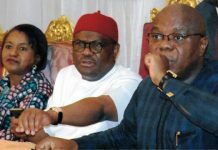 “My sense is that if a major Federal Government project is coming to your area, you put your differences aside, particularly for the fact that the project is a potential live changing assets,” he added. Fashola added that the commencement of the project was conceived by the Federal Government within the context of agitation for better quality of life in the Niger Delta.